The 15th China-ASEAN Expo and China-ASEAN Business and Investment Summit will be held in Nanning, Guangxi from September 12 to 15. Member of the Standing Committee of the Political Bureau of the Central Committee of the Communist Party of China and Vice Premier of the State Council Han Zheng and the leaders of the relevant countries will attend the opening ceremony and other events upon invitation. At the invitation of Prime Minister Nguyen Xuan Phuc of Vietnam, Vice Premier of the State Council Hu Chunhua will attend the World Economic Forum on ASEAN in Hanoi, Vietnam from September 11 to 13. Q: The ROK side said that ROK National Security Adviser Chung Eui-yong will come to China on September 8 and talk with Yang Jiechi, member of the Political Bureau of the Central Committee of the Communist Party of China and Director of the Office of the Central Commission for Foreign Affairs. Can you confirm it? A: Member of the Political Bureau of the Central Committee of the Communist Party of China and Director of the Office of the Central Commission for Foreign Affairs Yang Jiechi will hold talks with ROK National Security Adviser Chung Eui-yong in Beijing on September 8. This is a routine exchange of views where the two sides will discuss the situation on the Korean Peninsula, bilateral relations and other issues of mutual interest. Q: According to reports, Cambodia's new National Assembly was established on September 5, which approved the new Cabinet headed by Hun Sen on September 6. What is your comment? A: As Cambodia's best friend and close partner, China is glad to see that the new National Assembly and government have been formed in Cambodia in a smooth way. Premier Li Keqiang, Chairman of the Standing Committee of the National People's Congress Li Zhanshu and State Councilor and Foreign Minister Wang Yi have sent messages of congratulations to Prime Minister Hun Sen, President of the National Assembly Heng Samrin and Vice Prime Minister and Foreign Minister Prak Sokhonn respectively. We are convinced that with the concerted efforts of the new National Assembly and government as well as all the Cambodian people, Cambodia will achieve new and greater progress in its national development. This year marks the 60th anniversary of the establishment of the diplomatic ties between China and Cambodia. It is an important year for our bilateral relations to build on the past achievements and usher in a new future. China and Cambodia will continue to offer mutual support and mutual assistance to each other. The Chinese side stands ready to continue to help the Cambodian side develop its economy and improve people's livelihood to the best of its capability and work with Cambodia to build a community of shared future that is of strategic significance. Q: On September 6, the British government issued its latest biannual report on Hong Kong. What is your comment? A: Since the return of Hong Kong, the policies of "one country, two systems", "Hong Kong people governing Hong Kong" and a high degree of autonomy have been earnestly implemented. The basic rights and freedom enjoyed by the Hong Kong residents in accordance with law are fully guaranteed by the Constitution, the Hong Kong Basic Law and the local laws of Hong Kong. This is an undeniable fact. It is ridiculous for the UK to pose itself as a supervisor and make irresponsible remarks on Hong Kong affairs. The Chinese side can by no means accept that. China has stressed many times that Hong Kong affairs fall within China's domestic affairs, which brook no interference from any foreign country. The so-called "responsibility" that the British side claimed for Hong Kong does not exist. We are strongly dissatisfied with and firmly opposed to the British government regularly issuing the so-called biannual report on Hong Kong and making presumptuous remarks on Hong Kong affairs. We urge the British side to face the reality squarely and stop issuing such reports and interfering in Hong Kong affairs. Q: Recently Typhoon Jebi hit Japan. Also, a 6.7-magnitude earthquake rocked Hokkaido, causing casualties and losses of properties. Has China expressed its condolences to the Japanese side? A: We have noted that recently Japan has been hit by typhoon and earthquake. The Chinese side has expressed its sympathy to the Japanese side. We hope and believe that people in the affected areas could resume their normal work and life and rebuild their homes at an early date. Q: China Daily recently published an article, saying that the British navy ship entering the territorial sea of the Xisha Qundao could impact the negotiations for a free trade deal between China and the UK. What is your comment? A: With regard to the British navy ship entering the territorial sea of the Xisha Qundao without permission, I made clear the Chinese government's position on it yesterday and the Chinese side has lodged stern representations with the British side. As to China Daily's viewpoints you mentioned, I will not comment on that. But one thing is certain: what the British side did is wrong. It obviously runs counter to the consensus and spirit put forth by the leaders of our two countries that we are willing to join hands to build a "golden era" of China-UK ties. It will have a negative impact on the development of China-UK relations. We hope that the British side can recognize the severity of this issue and take concrete actions to correct their mistake. Q: Chairman of the Standing Committee of the National People's Congress Li Zhanshu will visit the DPRK and attend the celebrations marking the 70th anniversary of the founding of the DPRK. According to some reports, it is because of the trade disputes between China and the US that the Chinese side made such kind of arrangement. What is your comment? A: I do not know what is the source of the reports mentioned by you? I do not think that the arrangement the Chinese side made for this visit has anything to do with the current China-US trade issues. Like I said yesterday, as friendly and close neighbors, China and the DPRK have the tradition and practice of sending messages of congratulations to each other on the occasion of important festivals. Chairman of the Standing Committee of the National People's Congress Li Zhanshu, as General Secretary and President Xi Jinping's Special Representative, will head a Chinese delegation consisting of CPC and government officials to visit the DPRK and attend the celebrations marking the 70th anniversary of the founding of the DPRK. This special arrangement showcases the great importance the Chinese side attaches to China-DPRK ties as well as the sincere congratulations China extends to the 70th anniversary of the founding of the DPRK. Q: I have a question related to the earthquake in Hokkaido in Japan. At this point, is China considering providing any support to the Japanese side for this earthquake? 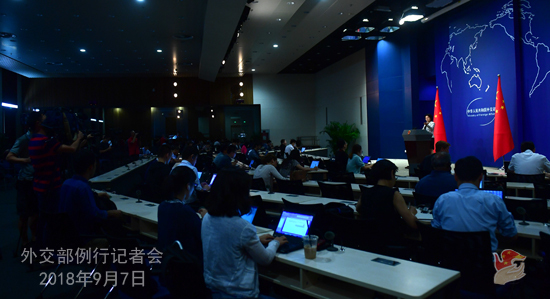 A: The Chinese side has expressed its sympathy to Japan over the Hokkaido earthquake and typhoon disasters. We believe that people in the affected regions could resume their normal work and life and rebuild their homes at an early date. According to my information, the Japanese side has not said that they hope the Chinese side could offer assistance by far. Q: India and the US yesterday held their 2+2 Ministerial Dialogue and signed the Communications Compatibility and Security Agreement. The two sides also called for ensuring maritime freedom in the Indo-Pacific region. What is your comment? A: We have seen relevant reports on the US-India 2+2 Ministerial Dialogue. 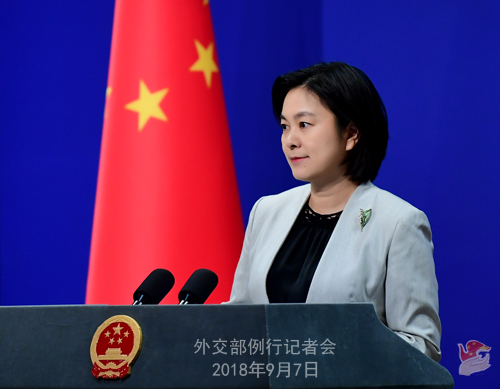 China is glad to see the two countries develop normal bilateral relations. We also hope that while moving forward bilateral relations, they could contribute more to regional peace and stability. 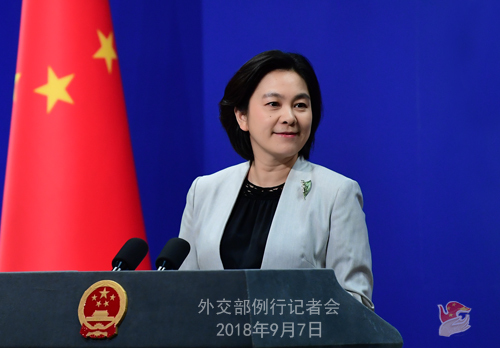 As to the two sides calling for ensuring the freedom of navigation you mentioned, China always upholds the freedom of navigation enjoyed by all countries in accordance with international law and hopes that all sides could make earnest efforts to ensure real freedom of navigation.